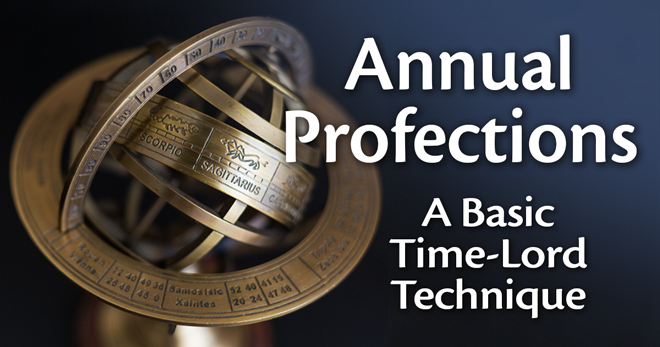 Episode 153 of the podcast is a recording of a webinar by Chris Brennan on an ancient timing technique known as annual profections, which is used to make yearly predictions about a person’s life. The lecture begins by introducing the concept of time-lord techniques in Hellenistic astrology, and how they are used to determine when the natal potential or promise of certain placements in the birth chart will become awakened in the life of the native. We then go into a detailed treatment of the basic method of using annual profections, and how to use the technique to make yearly forecasts and predictions, starting from the day of a person’s birthday or solar return. In particular we focus on identifying the main planetary ruler of the year, known as the lord of the year, and how to determine what topics or themes are likely to arise in the native’s life when this planet is activated, based on how it is situated in the birth chart. This episode is available in both an audio-only version and a video version, and you can find links to both below. For the rest of April I’m offering a 15% discount on my online course on Hellenistic astrology, and you can get the discount by using the promo code JUPITER when you sign up for the course. This code also works for the other courses and packages on my course site, although it expires on May 1. If you enjoy this lecture on profections then you would probably enjoy the full treatment of profections in the course, which includes a longer and more detailed 9-hour lecture. This 9-hour lecture is also available as a separate module in my annual profections class. These slides are meant to accompany the audio lecture, which you can listen to below. I follow and love all of your work Chris. How can we get your pdf’s from this lecture? do you need to be a patron? Hey Chris do you have a time frame when you will begin taking new clients for readings ? No, I don’t. At this point I’m just focusing on doing the podcast, teaching my online courses, and making videos on my YouTube channel, and that is already more work than I can handle much of the time. I’m referring consultations out to close friends who have the same approach, like Leisa Schaim, Kelly Surtees, Patrick Watson, and Austin Coppock. The Ruler of my 12th house is Mercury of course (Gemini as I mentioned above). Mercury in my natal whole sign chart is in the 6th, which I thought may be good with the 6th house connection to Mercury/Virgo, however, sounds like the 6th house is not a good house. Mercury is also in it’s detriment in Sagittarius. Not looking good. Saturn is in an applying opposition with this natal Mercury, at an orb of 1 deg. 9′ Ouch. And one more detail, for what it’s worth, natal Saturn is in a tight quincunx (00 deg S 46′) with natal Jupiter conj. North Node in Capricorn, in the 7th house. My Sun also resides in my 7th, though not in orb of any planets mentioned. I wouldn’t worry about it too much. One of the issues that astrologers sometimes run into with this type of predictive astrology is that sometimes it is easy to imagine the worst, but most of the time what actually happens is much more mild and manageable than we might fear at first. I think that learning how to deal with this in a healthy or constructive way is one of the challenges of learning and eventually mastering this type of astrology. Anyway, usually there are some mitigations involved, even in our most difficult placements, and it sounds like that is the case for you with Venus being involved, and there are probably some other things as well. I would just think back to other 12th house profection years and see if you can find any recurring themes, and that will probably give you some insight into what to expect from the period. As I was listening, it was just really checking all the boxes for Saturn working particularly malefically in my chart so I was worried. I really appreciate you speaking to the parts of life that can be challenging as being necessary to include in the scope of astrological work, to not do a disservice to the very real things that happen to people by bubble wrapping the language of interpretation. I also appreciate the quality of work you are putting out! You’ve inspired me to learn and grow and I am genuinely curious about hellenistic astrology. A year ruler won’t always be in its natural sign during the year it is “year ruler” for your chart. When it is, that usually means something good, but often its current position is in any other sign. This year Neptune is in Pisces, which is perhaps part of your confusion, but a review and applied practise of planetary rulership might help. A better example is looking to Jupiter which is the traditional ruler of Pisces. Jupiter, this year, is in Scorpio, which neither exalts or debilitates. So an interpretation of Jupiter as year ruler would be that it is neutral in strength according to exaltation or debility, while other factors covered by the remaining questions could alter that determination. One of your dozen or so best podcasts. Flowed well. Your style shines here to help reinforce and demystify the technique and the jargon. Has me looking forward to continuing to make my way through the online course/book. To anyone wondering about his Hellenistic course, it’s the most affordable, comprehensive course you can imagine. It’s a serious course for would-be professionals or serious hobbyists, and there’s not a better value out there in the astrological community. It’s easily worth triple the cost. Thank you Chris for sharing this great technique in such an interesting lecture! Out of curiosity, i’ve checked a few of the examples using the sidereal zodiac, and it leads to other interesting points of view. Steve Wozniak’s 2nd house profection activates Mars (which falls in his 2nd house), and therefore his Mars-Jupiter-Uranus grand trine, which clearly corresponds to entrepreneurship and innovation. Great timing for founding Apple, which, by the way, happened during a Jupiter-Uranus opposition! However, I would say Wozniak’s profection is not yet related to “becoming rich”, since that will only happy a few years later. Also worth noting, for that same year, Steve Jobs is having a 10th house profection in sidereal Taurus, activating Venus and its opposition to Jupiter-Uranus. Dr Dre: 2nd house profection is in sidereal Gemini, which activates Mercury in the 10th house, and its T-square with Jupiter and Neptune. Also note that Jupiter is the strongest benefic in this Day chart. George Luca’s 7th house profection falls in sidereal Libra, activating Venus in the 1st house (the body). This makes the Mars transit much more potent, since it’s actually hitting the Lord of the Year, Venus in the 1st house, and Mercury but also throwing a square to the Moon in the 10th house, which is in its detriment in Capricorn. Last but not least Saturn was also transiting the natal Moon!